Jan Farrington of TheaterJones published her review today of Tarrant Actors Regional Theatre‘s current production of Man of La Mancha and it is quite favorable. Congratulations to my wonderful cast and incredible crew for a most stellar show! We reached for that star and it proved reachable after all. When Man of La Mancha opened in Greenwich Village in 1965 (music by Mitch Leigh, lyrics by Joe Darion, and a script by Dale Wasserman, whose other ‘60s hit was his stage adaptation of One Flew Over the Cuckoo’s Nest), the show’s rag-tag appeal and eccentric hero set it apart—and audiences loved it, keeping the play going downtown and then on Broadway until well into 1968. It’s been revived endless times—sometimes buried in huge sets and special effects—but TART wisely sticks close to the show’s simple roots. Ellen Doyle Mizener’s weathered gray set design—wood railings and platforms hung with draped lengths of burlap—blends with costume designer Autumn Hyun’s rough, muted costumes. The overall effect is enhanced by Holli Price’s atmospheric lighting and Chase York’s projections. If you don’t know La Mancha by heart, this is a play within a play, a storytelling tour de force tucked into a prison drama. Spanish writer/actor Miguel de Cervantes (1547-1616), caught up in the net of the Inquisition (Catholic Europe’s attempt to combat the new “Protest-ant” movement by destroying all opposition), is tossed in a crowded cell to await questioning. His life—and the unfinished text of Don Quixote—are in the hands of a scraggly, thuggish-looking band of fellow prisoners. Entertain us, they growl, and we might not tear you and your book to shreds. Theater dude that he is, Cervantes (Brad Stephens) swings into action—diving into his trunk for fake swords and armor, searching the cell for “found objects” he’ll need (some clever prop choices by Don Gwynne), and giving the surprised prisoners parts to play in the story he’s improvising moment by moment. And so begins his tale of the old country gentleman Alonso Quixana [sic], who reads novels of knights and ladies all day long—so many that his brains dry up and he imagines himself into the bent, twig-thin body of “Don Quixote de la Mancha,” a knight errant (that means he’s on the move) out to save the world, one damsel and one injustice at a time. No matter that by Cervantes’ time, knights hadn’t been a thing for centuries: Quixote knows who he is. Are we to admire his out-there idealism, or not? The world hasn’t always quite approved of the Don. The word “quixotic” means clinging stubbornly to unrealistic goals. “Tilting at windmills” (DQ thinks they’re evil giants) implies a disastrously inflated view of your own strength and abilities. You don’t do La Mancha without A Voice, and Brad Stephens’ rich baritone and reach-for-the-rafters delivery scores high in the show’s blockbuster numbers, “Man of La Mancha” and “The Impossible Dream.” At the matinee show reviewed (the historically cursed second performance) Stephens struggled throughout with a sizeable moustache that simply refused to stick. Maddening and distracting, of course—and perhaps the reason his portrayal felt a bit flat at times. There’s plenty of urgency in Stephens’ great singing; no reason not to take that into a high-stakes performance as well. Amanda Williams Ware makes a gutsy, tough-as-nails Aldonza, the kitchen maid (and “whore,” she adds defiantly) who’s re-imagined by the Don as high-born “Dulcinea”—the patron saint of his quests. Ware has a terrific voice and emotional range, whether quietly puzzled in “What Does He Want of Me?” or burning with anger in “It’s All the Same” and “Aldonza.” And she keeps an impressive side-eye trained on the gang of male prisoners who circle her like wolves. Alex Krus (he directed TART’s 2017 Gutenberg! The Musical!) has a light, pleasantly piercing voice—and is sly and funny as the farmer Sancho Panza, roped in to be the Don’s faithful squire. A practical guy with his feet on the ground, Sancho admits he only stays in this loopy adventure because “I Really Like Him.” When he can, Sancho does his best to get between Quixote and the dangers he doesn’t see coming. Jason Solis, seen as the Taxi Driver in Artes de la Rosa’s Women on the Verge of a Nervous Breakdown, is a standout among the smaller roles. He sings like an angel, and scores playing both the neighborhood “Padre” and an Alladin-esque gypsy carnival performer. Solis teams with Emma Bruce and Kristal Seid, both marvelous singers, as the niece and housekeeper who assure the priest they’re “only thinking of” the old man’s welfare as they try to stop his wanderings. Their trio has gorgeous harmonies—and at the end of the play Solis also leads a ringing chorus of the old Latin hymn “De Profundis” (“Out of the depths I cry to you, O Lord”). Michelle Phillips, playing an innkeeper’s wife, literally jumps on a table to rouse us with “Knight of the Woeful Countenance,” and Kelley Garland is strong and sturdy as the Innkeeper. John Tillman comes on cool, brainy and sharp-edged as the niece’s fiancé Dr. Carrasco and the prison trial’s “prosecutor”—who dislikes Cervantes’ make-believe. Chase York is amusing as the cheerfully confused barber whose shaving basin becomes Quixote’s golden helmet. The group of male prisoners (and the few women among them) make a good chorus—and what’s more, they’re “all in” for every moment onstage. As the audience for Cervantes’ story, they grin, applaud, lean in, wince in sympathy. And when called on to play a part, transformations are instant. Kirk Corley’s presence and Carlo Aceytuno’s fight moves are notable among the crowd, and Chris D’Auria’s expressive face keeps catching the eye. At the performance reviewed, there were body-mike issues—most seriously for Amanda Ware as Aldonza/Dulcinea. Ware has a big voice and beautiful control over her singing—but her mike just wasn’t right. (The innkeeper’s wife, similarly equipped, nearly blasted us out of our seats.) The audience struggled to hear some of Ware’s softer, lower passages; that’s a shame, and needs a fix. Also, the prerecorded orchestral track needs to be dialed down at more than a few moments when it overwhelms the good singing onstage. Again, it’s TART’s first time at Scott—no surprise that things need adjusting. Tilting at windmills? Time will tell. But they, and we, share a grand tradition of imagining a different, better world. And in Cervantes’ bony, brave old knight, we can choose to find a mirror reflecting our own faces—and a challenge to decide who we are, and what we hope for. Man of La Mancha closes Sunday, October 14th. Tickets may be purchased at Tarrant Actors Regional Theatre. Wow. That best sums up the performance I saw this past Sunday afternoon in the Sanders Theatre at the Fort Worth Community Arts Center. Wow. There are shows that are technical wonders and there are some that glorious affairs with actors singing and dancing often at the same time and then there are shows like this. An incredibly written script that relies heavily on the ability of the actors. A show like this, a murder mystery that will surprise you at the end, will only be effective if the actors are fully immersed in the play, the action/reaction and interplay between the characters. And let me tell you buddy, Tarrant Actors Regional Theatre has assembled an A++ ensemble for this production. I really do not want to give away any spoilers so let me just sum up the plot this way. Set in an upper-class apartment in New York City in 1944, detective Mark McPherson has fallen in love with Laura Hunt. Problem is, Laura is dead, and he’s in charge of her murder investigation. From her portrait, her letters, her personal effects, and from his contacts with the three men who loved her, Mark has created an image of a woman tantalizingly real. As the story progresses, Mark discovers lies, infidelities, and hidden identities, all leading him into a labyrinthine search for Laura’s killer. Laura is a thrilling mystery in the film noir style played out in three acts. Now I pride myself on being able to figure out the murderer before the final scene. I do it so often that it drives my wife nuts. However, I did not figure this one out at all. Thinking back on the action leading up to the climax, I remembered things that should have pointed to the killer. Fear, utter surprise as things were revealed, statements made out of context were all used deftly by all the actors involved. Robert Banks as Waldo Lydecker, the pompous friend/benefactor of the deceased Laura was brilliant. I use that word a lot so let me expound on that. He was utterly stinking brilliant. The small details of his character, the ash flick at the back of a person he does not like, his sly delivery of sarcasm the completely believable reactions to situations on stage. Actually, one of the best performances I have seen in a while. Laura Louise Smith as “a Girl” was completely spot-on with the nuances of her character that reveals the secrets that push the plot. Her side glances, facial expressions even the way she changed the gait of her walk on stage between situations was a clear indication of her thorough mastery of this character. Brad Stephens convincingly portrayed the cop who knows he should become emotionally attached to his case and struggles when he realizes he is doing just that. His character was a little flat, but then, he is a detective who is not used to showing emotion so again, it was spot-on. Sean Malloy as the love-struck teen enamored with Laura was maybe just a bit too old for the part but played as well as anybody could have. Andrew Manning as the fiancée, Shelby Carpenter, was powerful and precise as he was trying to hide certain things about Laura. Cynthia Daniels, Laura L. Jones, all the cast was just an impeccable assemblage of talent that could not have produced a better hour and a half of entertainment. The unseen star of this production is Ryan Mathieu Smith. Ryan is the costume designer and every stitch of clothing on stage was perfectly parallel to the 1940s. I can remember seeing pictures of my mother in those dresses and coats. The men’s suits were tailored close to the forties style without being cliché ‘murder mystery’ stock. I could tell the time and research put into his efforts and the result was exceptional. I truly, whole heartedly recommend seeing this show as it might be the best drama presented this year in the DFW Theatre scene. With two weekends left in its run, Circle Theatre’s hilarious production of Too Many Cooks is enjoying sold-out performances, uproarious laughter, and standing ovations. Strong word-of-mouth and stellar reviews are driving ticket sales. Seats for the remaining eight performances are going fast. The show takes its final bow Saturday, November 16, 2013. For information and to purchase tickets, go to www.circletheatre.com or call the box office at 1-817-877-3040. You may also go in person to the Circle Theatre box office at 230 W. 4th Street, between Houston and Throckmorton, in downtown Fort Worth. Tickets range from $20 – $35 depending on the day of performance. Senior, student, military, KERA, Press Pass, S.T.A.G.E. and group discounts are available. re-blogged from Stephen B. Chambers Architects, Inc. The GHOST SONATA takes place in a mystical dream world through which mortals wander before reaching the kingdom of death in afterlife. As a boy, I was thrilled with an invitation to ride with my friend, Jimmy Wolf, to the Texas State Fair on Elementary School Fair Day. His father had a workshop/studio on the fairgrounds in what later became the Women’s Museum. Jimmy and I could just ride through the gates of the fair with his dad, no tickets necessary. Little did I know that when the day was over, I would be more fascinated with the studio and shop of Peter Wolf, the renowned theater set designer, than the fair itself. The old painted sets from South Pacific, Oklahoma, and others were stored in his immense workspace. His craftsmen were busy preparing sets for productions that I could only imagine. Revelations of the characters’ past lives form the action of the play and themes relate mainly to secrets, illusions, disappointments and tragedies of life. Like other Dallasites, my first introduction to theater was through the Dallas Summer Musicals. Up close, these sets looked like cartoons. It was hard for me to understand how billboard-sized illustrations could appear to be so realistic during the musicals. What magic transformed the two-dimensional flats into a South Pacific island in WWII, another place and time? This experience may not have had an influence on my career in architecture. 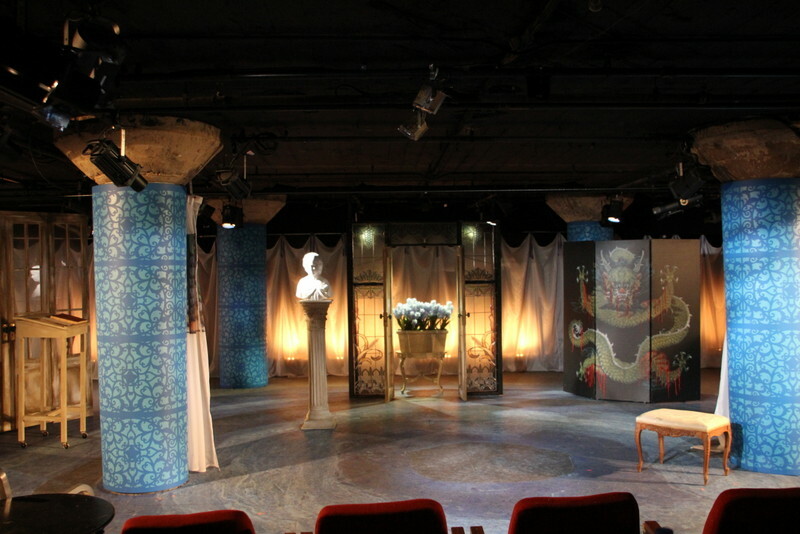 But, I certainly see the connection today between my architectural practice and the design of theater sets. 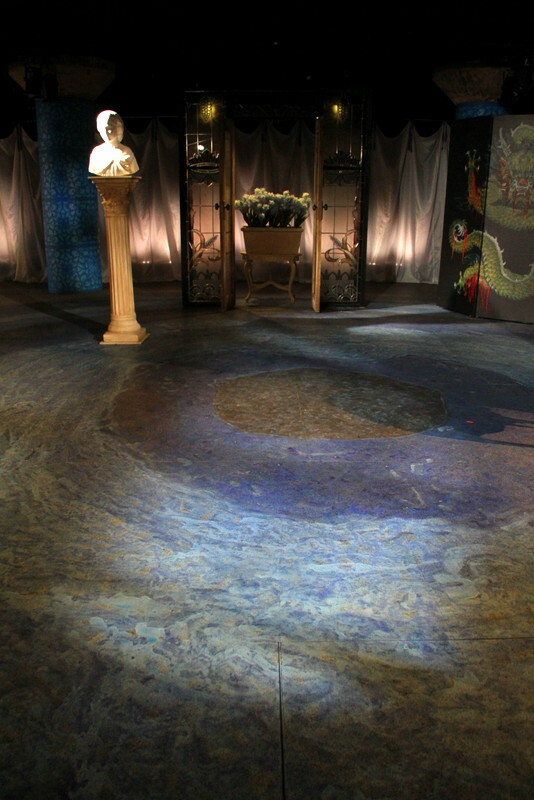 I was reminded of this youthful amazement when I saw the sets for The Ghost Sonata, an upcoming play by August Strindberg at the Undermain Theatre. Stephen B. Chambers Architects, Inc. is a sponsor of the Theatre and our Marketing Director, Stephanie Chambers, is on the Board of the Undermain. We read in the newsletter that Strindberg’s Chamber Play will have phenomenal set design. I was curious to walk through the set and see what it might be like. I grabbed my camera and headed downtown to the theatre’s home under Main St. in the Deep Ellum area of Dallas. Paintings on the floor assist the audience in the suspension of reality, catapulting them into the dream-logic of the play. Artistic Director Katherine Owen graciously greeted and led me on an impromptu tour of the set. The architecture of the scenery for The Ghost Sonata drew me in immediately and opened the door into Strindberg’s world, a surrealistic setting far removed from downtown Dallas. 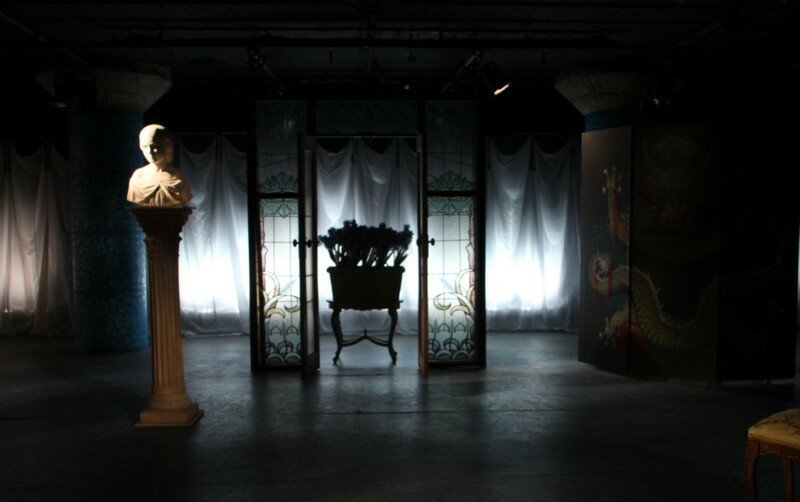 This creative theater company makes their basement locale of structural columns and low ceilings suddenly disappear in innovative tales through the immensely talented assemblage of set, lighting, costume designers, directors, and actors and top-notch construction team. The themes in Ghost Sonata relate mainly to secrets, illusions, disappointments and tragedies of lifePaintings on the floor assist the audience in the suspension of reality, catapulting them into the dream-logic of the playI know little of the art, science or history of stage set and lighting design, but deeply feel its relationship to architecture. In many ways, the theatrical scene designer is much like a conventional architect. The designer must make real what only exists in his/her imagination and provide the vision in a graphic form for use in building the sets. Both architects and set designers use a flat page of two-dimensional construction drawings to communicate what the three-dimensional structures will be. Set design has a similar ability to elicit specific emotions and create mood with the use of perspective, space, scale, light, color, detail and proportion. It helps to define the characters and propel the ideas of the playwright. 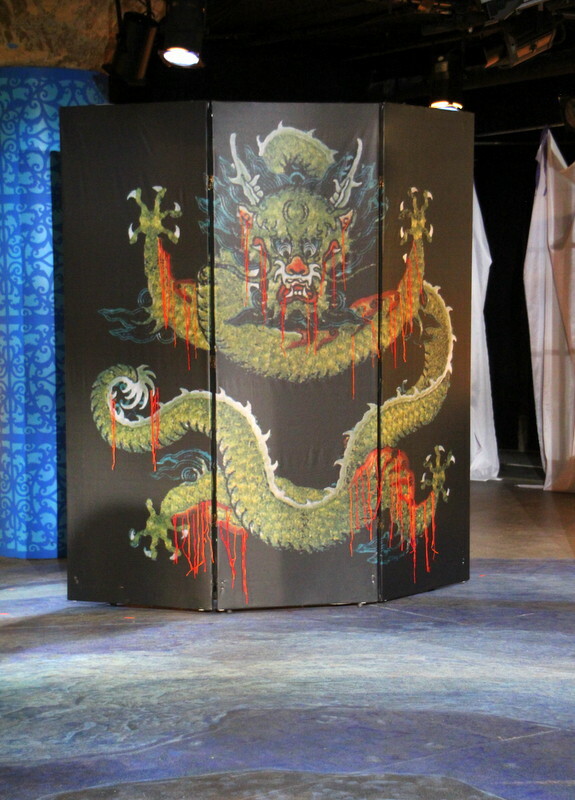 There is a language in theater scenic art that signals sophisticated clues to the viewer. Through its subtext it telegraphs context, location, relationships, time, mood and space. Different from architecture, scenic designers must knowingly create environments that have a brief lifespan, are moveable, do not require the same rigor in construction, and are generally viewed from only one direction. Theater sets do not need to have complete integrity in the structures that they are meant to depict. Stage design and lighting create the illusion of three-dimensionality and can manipulate time and place. Audiences will not walk around and through rooms to experience the massing, proportion, mood and emotions its spaces create. 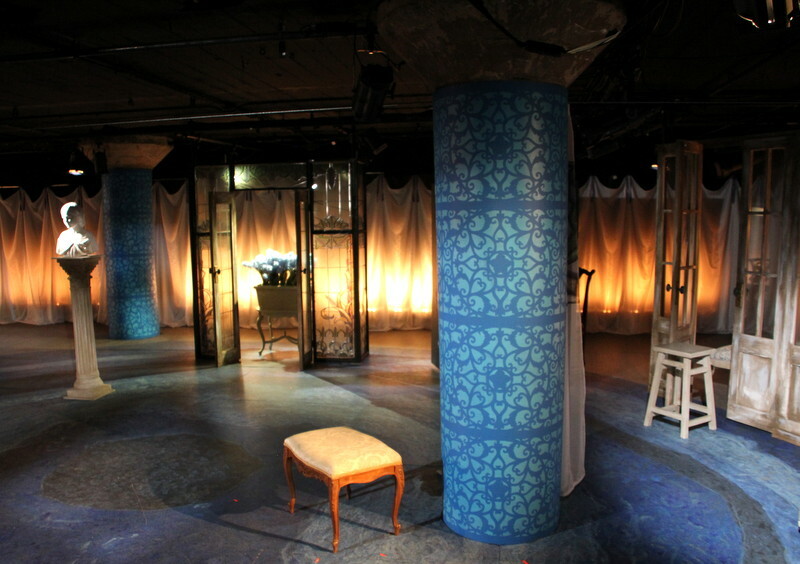 The set designers develop a world for the play, which becomes a real construction project, ultimately introducing their imagined world to the audience. The skill of the lighting designers, directors, actors, and costumers complete the transformation. Though written in 1907, Strindberg’s The Ghost Sonata is highly unusual modern theater in many regards. The relatively swift three-scene structure is based on sonata form, rather than traditional theater construction. It creates an atmosphere by repeating various themes, rather than developing a story through conventional portrayals of character and a linear plot. The Undermain’s interpretation and production of this play will, no doubt, thrill serious Dallas theater followers. But, the sets and lighting for this production, for me, stand alone as compelling art.